Lauren Dibble was at the lowest point of her life: living at home, going through a messy divorce, working unfulfilling temp jobs and shuttling between doctors to try and diagnose a mysterious illness. She needed a way to take her life back into her own hands, and saw a venue to do so through homesteading. 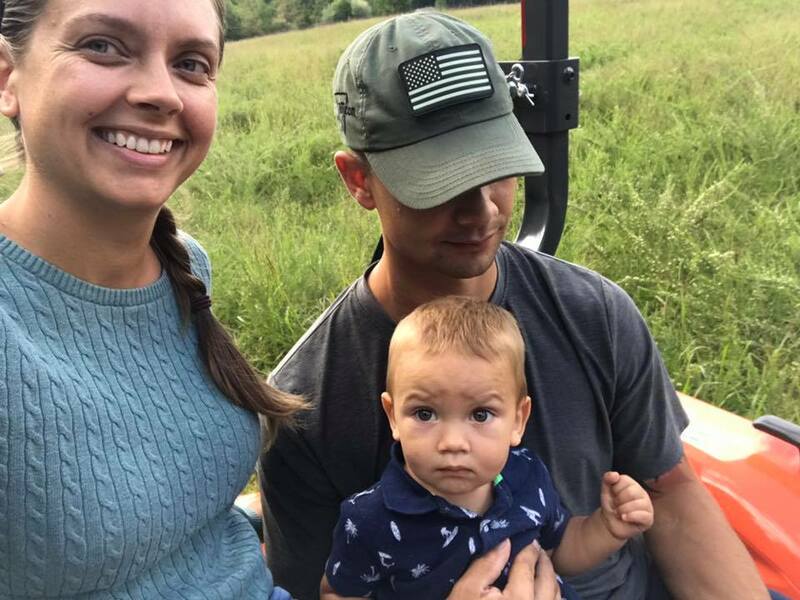 Dibble now blogs at Hillsborough Homesteading, where she chronicles her self-sufficiency journey with her husband and young son. Dibble chats with us for our series, Behind the Homestead Blog, about her darkest days, the trick to a successful homesteading marriage and what she hopes for the future of her homestead. Hello Homestead: Tell me a little bit about your background. Where are you from, and what was your life like before you started homesteading? Lauren Dibble: I grew up in suburbia – very close to Washington, D.C., but backed up against 100 acres of national forest. My formative years were spent surrounded by cattle and farm land, in a one-light town, where everyone knew everyone. Think of Mayberry [from "The Andy Griffith Show”]. HH: When and how did you get started on your homesteading journey? LD: My drive for self-sufficiency actually came from the lowest moment of my life. I was living paycheck to paycheck working a bunch of temp jobs I hated. I was going through a nasty divorce. I had a series of mystery illnesses that the doctors couldn’t diagnose. And I had spent every last penny on the divorce and doctor’s bills. It didn’t take me long to realize that I was in my lowest point because I had given everyone else power over me, and that to really thrive I needed to take some of that power back – to start providing for myself. I started by doing little things – growing a garden, changing my career field, canning vegetables, getting out of debt. Fast-forward 12 years, and here we are! LD: Starting a new vegetable garden. My father had a ton of tomato seedlings that he had no room for, so we set about clearing the sod [a[and]dding compost and a makeshift fence. Next came chickens. Again, we had a friend giving away her flock, so off we rushed to Tractor Supply for a coop. Then — and we’re still working on this one — was to uncover the decades-old orchard. We didn’t realize there was an orchard when we bought the house, but were delighted to find it buried under 5 years of overgrowth. HH: When and why did you decide to start blogging? LD: I started blogging really when I started homesteading. I was so excited by all of the experiments I was doing, the things I was learning, that I wanted to share it with everyone else! It started as a fun hobby, but it wasn’t until this past year that I seriously began to look at it as a way to afford the lifestyle we truly want. HH: According to your blog, you homestead with your husband. What are your secrets to having a happy marriage while homesteading? LD: Being on the same page. Every morning we check in with each other about our expectations for the day [a[and]hat we hope to accomplish. We make sure that we agree on the priorities and always make some special time for us. Homesteading is hard work and it takes a solid team to make it happen. HH: Now, you also homestead with your kids. What is it like raising children on a homestead? LD: Hard! Don’t let anyone tell you that it’s not! For about the first two years of our littest’s life either my husband or I could be productive, but not both. My advice is to slow down during those years – take on less projects. Now that he’s almost three he’s starting to actually be helpful and that is so worth the two years of compromise. HH: Are there any chores your kids help with around the homestead? LD: Kids want to do what they see Mommy and Daddy doing. My son has a ton of toys but would rather sweep, or mop, or garden or help with the chickens than play with any of his toys. Let them help! It’s messy, and takes forever, and is often super-frustrating (at least for a Type A personality like me), but eventually they get better and better at it, and the pride and confidence on their face when they’ve mastered something new is priceless. At 2.5 my son helps cook, helps do laundry, collects the eggs, feeds the dogs, feeds the chickens [a[and]elps in the garden. HH: You write a lot about self-sufficiency. Why is this so important to you? LD: When I was going through my dark days, it was because I had given up my own power to others around me. I gave my hours to a job I hated, my money to the landlord and electric company. I relied on the grocery store to feed me, and the doctors to heal me. By learning how to be self-sufficient, we empower ourselves to take control, provide clean, organic, nutritious food for our families, heal our families with herbs and home remedies, take our time back to spend it on what’s important to us. Self-sufficiency used to be the only way to live, and now it’s a rarity. Gaining that independence back, to me, is the surest way to a life well lived. HH: What projects are you currently working on for your homestead that you are really excited about? LD: We’ve just upgraded our chicken coop to accommodate 30 to 40 chickens. Once the ground thaws, we’ll be adding a large run next to it. In addition to the coop, we’ll be building some chicken tractors. I’ve started studying all things permaculture and I’m really excited to begin implementing some of the things I’ve learned to help improve our soil and efficiency. HH: What are your goals for the future of your homestead? LD: This year, we should be able to produce 80 to 90 percent of all of our fruits, vegetables and eggs for the year. We’re also starting a CSA, so we’ll be able to make a bit of money, too. Next year, we’ll be adding livestock to that equation. I’ve also completed Herbal Academy’s introductory herbalism course and am in the middle of their intermediate course. We’re also saving up the money I earn from the blog to purchase solar panels for the house to be totally off-grid. Our goals are to be as self-sufficient as possible. This means … making enough money off of the farm that we don’t have to work 9-to-5’s if we don’t want to.